Intermittent fasting may improve fat loss and allow you to eat more cheat foods than a traditional diet, but how do you do it, and how does it work? Jim Stoppani, Ph.D., has your answers! I believe in thoroughly enjoying life and enjoying delicious foods, but I'm also passionate about maintaining a lean, muscular physique. These two pursuits, if you've never personally tried juggling them before, can be extremely difficult to balance. That's why I've been following an intermittent-fasting (IF) eating plan full time for a while. With intermittent fasting, you can eat the foods you want—within reason, of course—without packing on a ton of fat. But I'm not just now hopping on the intermittent-fasting bandwagon; I've been a proponent of it for many years. In fact, more than a decade ago, researchers from Yale University School of Medicine alongside a team at the University of Copenhagen explored fasting and fat loss, and their positive results in the lab have helped in my own pursuit of a lean physique ever since! If, like me, you're interested in keeping body fat low while enjoying some of your favorite foods along the way, IF may be exactly what you've been looking for. To help you decide, I'm going to answer some common questions about IF and offer some useful tips so you can get the most out of your fasting program. Intermittent fasting is simply the practice of going an extended period of time taking in zero calories—basically drinking only plain water and either black coffee or tea. Many variations of IF exist, but my preferred method involves fasting for 16 hours, then eating all of my food during an eight-hour window commonly called the "feeding window." This type of IF is often called "16:8" fasting. Does Sleeping At Night Count As Hours Toward The Fast? Yes, it does. So, for example, if you have a protein shake right before bed, then wake up eight hours later, you're already eight hours into your fast with only eight more to reach your goal of 16. If you have a protein shake right before bed, then wake up eight hours later, you're already eight hours into your fast with only eight more to reach your goal of 16. What Should I Eat Or Drink While Intermittent Fasting? Obviously, you don't eat anything or consume any calories during your fasting hours—simply put, don't eat any food or shakes. Water, of course, is perfectly fine. Other than that, opt for zero-calorie, unsweetened beverages. My personal favorites include black coffee—with no milk, cream, sugar, butter (for you bulletproof-coffee fans), or anything else in it—and plain, unsweetened teas like black tea or green tea. When it comes to calorie-free drinks with artificial sweeteners (like flavored waters and diet soda), there's a bit of uncertainty. There's some evidence to show that some artificial sweeteners cause an insulin response, which would then blunt your ability to burn fat and contradict the point of being in a fasted state, but that's up for debate in the scientific community. To be on the safe side, I recommend not drinking artificially sweetened beverages during a fast. If you're absolutely dying for something other than water or plain coffee or tea during the last few hours of a fast, opt for a sparkling water that's very lightly flavored with something like natural lime. Do I Need To Cram A Day's Worth Of Meals Into Eight Hours? Regarding the "feeding window" (AKA the joyous time during which you get to eat), you want to reach the same calorie and macronutrient totals as you were before—meaning amounts of fat, carbs, and protein—provided you were already on a solid diet plan that corresponded to your goals, of course. You definitely don't want to undereat during your feeding window, or you'll compromise your performance in the gym and your ability to build or maintain muscle mass. Get in all of your nutrients, particularly protein. This is especially important for bodybuilders and anyone with strength-building goals. In theory, you'll be eating the same number of calories and macros per day, just with a different meal schedule than a typical eat-every-few-hours nutrition plan. Of course, you can always tweak calories and macros if and when your physique and training goals change. Greater Fat Burning: Research has shown that fasting for relatively long periods may result in greater fat burning and accelerated fat loss, even when total daily calorie intake remains the same. Most people find that they're able to have a few more of their favorite "cheat" foods during the feeding window and still see results. This is why IF is such an appealing diet for many people. Adherence: Other reasons why so many individuals love IF are that it's relatively easy to get used to and stick with, and it's a diet you don't have to discontinue—ever. You can do intermittent fasting long term with no adverse health effects. Instead, you'll actually see health benefits from IF. How Does Intermittent Fasting Enhance Fat-Burning Compared To Standard Diets? The Yale/Copenhagen group published several papers showing that one of the key mechanisms in fasting-induced fat loss has to do with an increase in the activity of genes that increase the number of calories the body uses and the amount of fat it burns. When you fast, your body turns on genes that encode for certain uncoupling proteins and enzymes that increase fat oxidation—which is to say it turns on the fat-burning mechanisms of the body. The uncoupling proteins basically "poke holes" in the mitochondria inside muscle cells. The mitochondria are where most of your energy is derived from, especially at rest. By poking holes in them, your mitochondria produce less energy and thus have to burn far more calories to produce the same amount of energy in the form of ATP. In other words, you may use more calories as a fuel source during the fasted state, which can aid your weight-loss efforts. What Should I Eat As My First Meal Following A Fast? That's a good question. Intermittent fasting allows you to be somewhat loose with your eating compared with other diets, but that doesn't change the fact that high protein intake is important, along with healthy fats and complex carbs. Coming off of a fast, I recommend a high-protein meal as opposed to one loaded with carbs. Work from the lab at Yale found that when you fast then refeed with a low-carb meal, the activity of the genes that increase calorie consumption and fat burning is further increased with the meal. However, when you refeed with a high-carb meal, the activity of many of these genes is decreased. How About BCAAs? Can I Sip On Those During My Fast? I get why people do this: to help preserve muscle mass while in the fasted state. But when you're consuming branched-chain amino acids (BCAAs), you're not truly fasting. As you probably know, amino acids combine to form protein. There are 20 aminos that are used as the building blocks of protein, including the nine essential amino acids (leucine, isoleucine, valine, tryptophan, threonine, phenylalanine, methionine, lysine, and histidine), as well as the 11 nonessential amino acids (arginine, serine, cysteine, glycine, proline, alanine, tyrosine, aspartic acid, asparagine, glutamic acid, and glutamine). If you consume just one of these amino acids, you're essentially consuming some small amount of protein and therefore are technically not fasting. One exception for using BCAAs during fasting is if you train in a fasted state. Here, you can sip on BCAAs (along with the other aminos) during your workout. When you're exercising, BCAAs are a powerful source of energy for the muscles. And since you're just sipping on a drink with BCAAs in it, you're not pounding down a bunch of them. The benefits of BCAAs for your workout outweigh any potential negatives. Amino acids that aren't proteinogenic can be consumed during fasting. For example, it's OK to have beta-alanine, betaine, D-aspartic acid and—even though they're not technically amino acids, but many people classify them as such—L-carnitine and creatine. These are fine to sip on during the day, especially if you're training in a fasted state. Nutrition is only one aspect of successful weight loss. You also need a solid training plan. 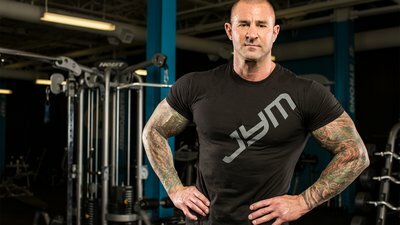 Pair Jim Stoppani's Shortcut to Shred program on Bodybuilding.com All Access with intermittent fasting and get ready for serious results. Keys, A., Brozek, J., Henschel, A., Mickelsen, O., & Taylor, H. L. (1950). The biology of human starvation. (2 vols). Stote, K. S., Baer, D. J., Spears, K., Paul, D. R., Harris, G. K., Rumpler, W. V., ... & Longo, D. L. (2007). A controlled trial of reduced meal frequency without caloric restriction in healthy, normal-weight, middle-aged adults. The American Journal of Clinical Nutrition, 85(4), 981-988. Hildebrandt, A. L., & Neufer, P. D. (2000). Exercise attenuates the fasting-induced transcriptional activation of metabolic genes in skeletal muscle. American Journal of Physiology-Endocrinology and Metabolism, 278(6), E1078-E1086. Pilegaard, H., Saltin, B., & Neufer, P. D. (2003). Effect of short-term fasting and refeeding on transcriptional regulation of metabolic genes in human skeletal muscle. Diabetes, 52(3), 657-662.